This institute combines in a single building intermediate, advanced and university education in health care and welfare. On plan it is a triangle with gently rounded corners. At its heart is a diagonally ascending cascade of atria shot through with stairs, escalators and bridges. This is intended to draw together the different types of education and encourage students to mingle. Spatially this vertical public zone stitches together the various common spaces, with the principal lecture hall a mysterious volume suspended in midspace. Partition walls in this public zone are white or finished in bright colours representing the different types of education. 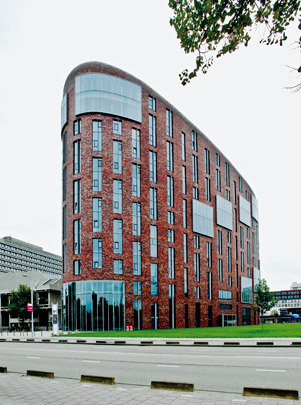 The external facade is of brick with vertical slits of fenestration and larger areas of glass where the atria or common spaces meet the facade.